Tipico is one the most popular sports betting brands in Europe. The company is licensed by the Malta Gaming Authority (MGA) and has made a name for itself as a reliable bookie with fast payouts, a great first deposit bonus for its new customers, and numerous live betting events. In this guide we will explain why you should consider using Tipico if you enjoy placing in-play or live bets. You can place your bets on your desktop or via their easy to use and convenient Tipico mobile app. 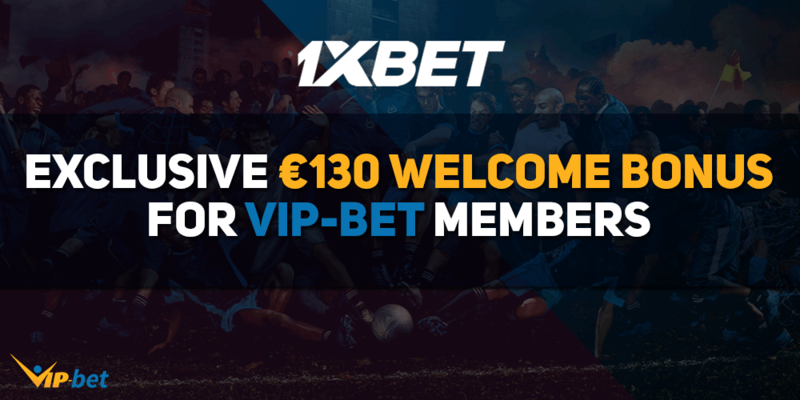 Great €100 First Deposit Bonus for New Customers. Fast loading times, great website design with a decent overview. Detailed statistics for every event. Tipico live betting is available for the most popular kinds of sports. There are football, tennis, basketball, and ice hockey betting markets. Tipico provides the most betting markets for football matches. There are especially a lot of different betting markets for major games like Champions League or Europa League matches. Moreover you can place bets on special betting markets for many games of the German Bundesliga, Spanish La Liga, British Premier League, and many others. 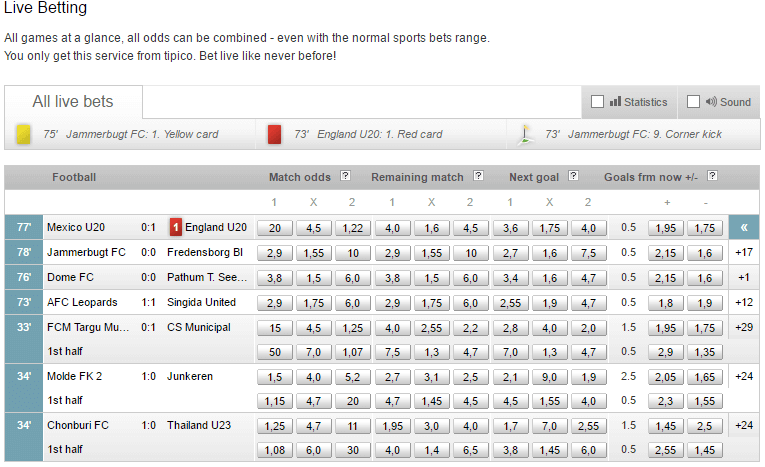 These betting markets are highlighted with a golden number next to the match. Live bets in the Tipico live betting area are usually processed really fast. 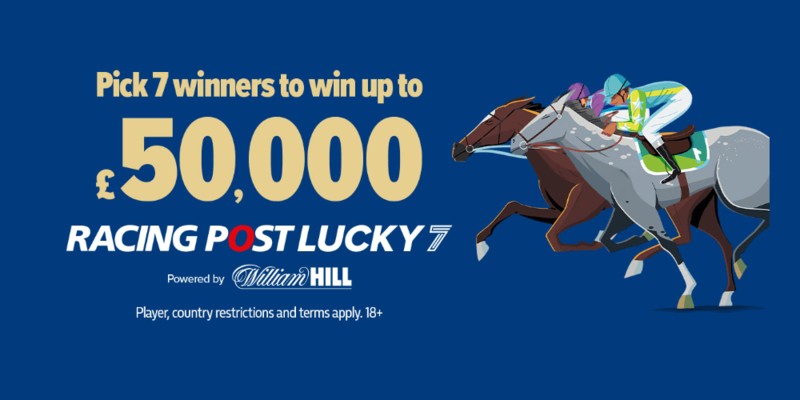 If some odds of your selection have changed you will be notified and your current bet will be put on hold. That’s a really useful feature if you are busy and have been paying attention to a different match. It helps you to avoid mistakes and prevents you from placing bets at odds you did not mean to. 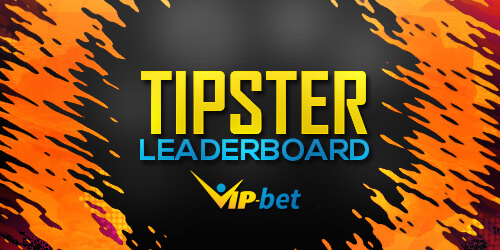 The Tipico First Deposit Bonus can be used to place bets in the in Tipico live betting area. You will be credited a maximum of €100 on top of your first deposit. 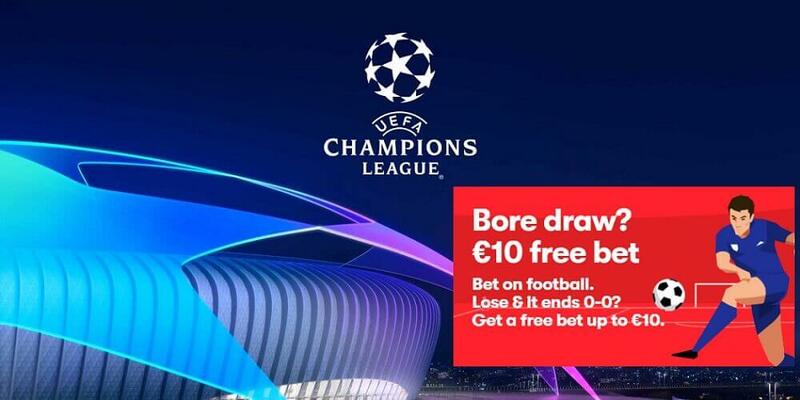 It is a 100% matched bonus, which means that you have €100 or more in order to claim the maximum bonus. 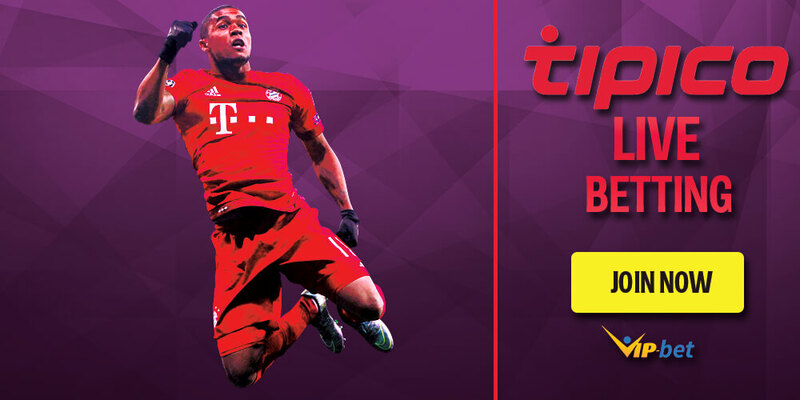 After your deposit has been processed you can start placing bets with your Tipico bonus. How Does Tipico Live Betting Work? Placing Tipico live bets is really similar to regular pre-game betting. First of all you need to navigate to the Tipico live betting area. You can do so by clicking on the “More Live Betting” button on the Tipico homepage right in the middle of your screen. Alternatively you can choose Live Betting in the top overview bar of the Tipico homepage. Once you have opened Tipico live betting you will see a overview of all currently running events. 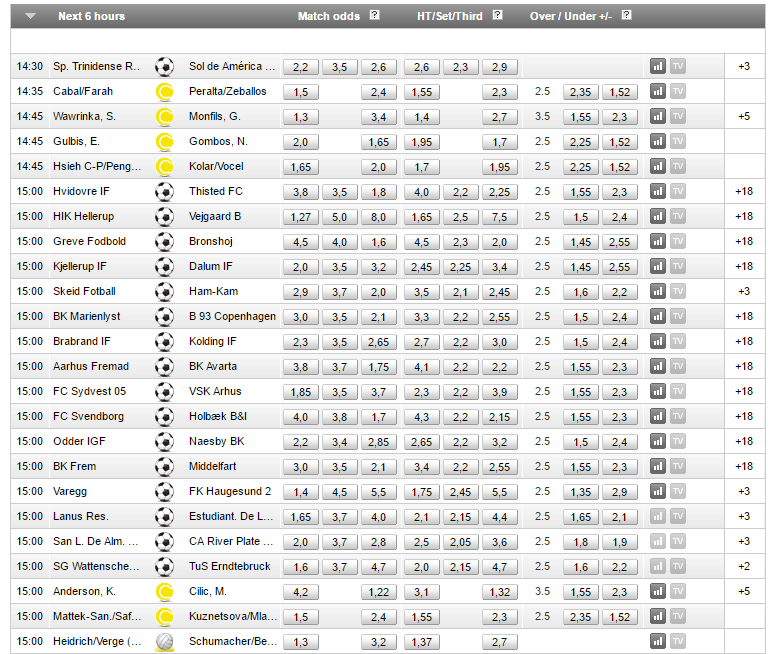 Football is always displayed on top of all sports and there are many different football betting markets to choose from. Underneath the football live matches you can see all live betting sports like tennis, basketball, ice hockey, handball, volleyball and more. You can add your selection by simply clicking on the odds you want to bet on. 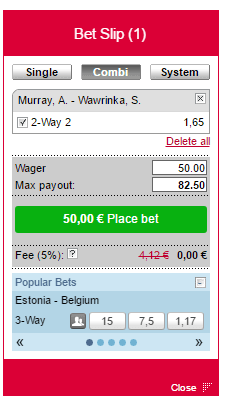 It will automatically be added to your bet slip which can be found on the right side of your screen. The main Tipico live betting markets are match odds, remaining match odds, next goal markets, and goals from now betting markets. The most popular live betting markets for tennis and basketball events are match odds, set bets, set score bets, sets overall, handicap and point spread betting markets. Even though Tipico does not offer live streaming coverage, there are many benefits when placing live bets. First of all you will notice the clean layout and great overview of all betting events. It is really easy to find your match of choice when using Tipico live betting. All currently running events are displayed which is not the case for most of the other bookmakers. Tipico has put a strong focus on football live betting and therefore it’s no surprise that they offer a lot of different football live betting markets. They offer many additional and special betting markets for major games like Champions League or Bundesliga matches. However, football is not the only sport offered in Tipico live betting. They provide you with decent live betting coverage for all ATP and WTA tennis events, NBA games, NFL football matches and much more. Tipico also offers you many live betting options for rather unknown and less popular events. That’s especially great if you are really interested in placing bets on underdogs and minor leagues. We don’t recommend placing live bets in the first few minutes after a match has started. Instead, you should try to figure out how teams and players are approaching the game. Take your time to analyze the game and place a bet after a little time. This will definitely help you to increase your profit. Smartphone and tablet users can now download the official Tipico mobile app and place their bets from wherever they want. The Tipico mobile app is available for Android and iOS device users and offers an extensive range of pre-match and Live markets. You can download the app in the App Store or Google Play. The Tipico app is really easy to use and offers you the same features you benefit of when using the desktop version. Download the Tipico app now and claim your exclusive €100 first deposit bonus on top! Download the Tipico App Now!